Even though the Elantra just won car of the year at this year’s North American Auto Show, Hyundai is hoping to keep the line fresh by introducing a coupe version of their C-segment sedan. It has been spied recently on the back of a flat bed. We knew this was coming and in terms of design there’s really no surprises here other than that dent in the rear quarter panel. Careful now! 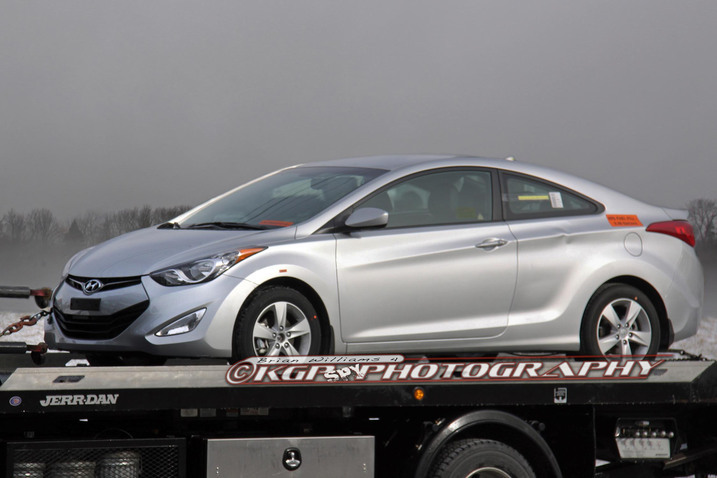 So, coupes are generally known for being of a more sporty nature than their sedan counterparts and the Elantra coupe is…. different from this assumption. So far as I can tell, there will be nothing to set it apart from the sedan in terms of performance. Hell there’s nothing that sets it apart in design either except for less doors. It will get the same 1.8 litre inline four that makes 148 horses. Um, not exactly inspiring performance numbers. Well, surely they will have reworked the suspension. Nope, not at all. Basically this is a just a less practical Elantra. Why would anyone want that? You’d think Hyundai would have learned from GM’s Cobalt and Pursuit coupe variants that just chopping off two doors doesn’t make it a performance car. And at least GM had the decency to offer real performance upgrades to those cars in different trim levels. It’s not as if Hyundai isn’t capable of performance either as demonstrated in the current Genesis coupe and upcoming 2013 Genesis coupe. Overall this Elantra coupe smells of poseur performance. And it will likely sell well because of it. Shame.